Hydro Jetting is one of the most effective techniques in drain and sewer cleaning. Build up, blockages, and even debris can be rinsed away by a large volume of water. At Rapid Plumbing, our high powered jetters are capable of delivering hundreds of gallons of water quickly at several thousand pounds of pressure per square inch. RapidPlumbing technician performing hydro-jetting services. This is in some contrast to the plumber's snakes, which can clear a path but often leave parts of the pipes totally untouched. Jetters can even deliver enough cutting power to blast away intrusive tree roots and dirt encroaching into underground pipes. 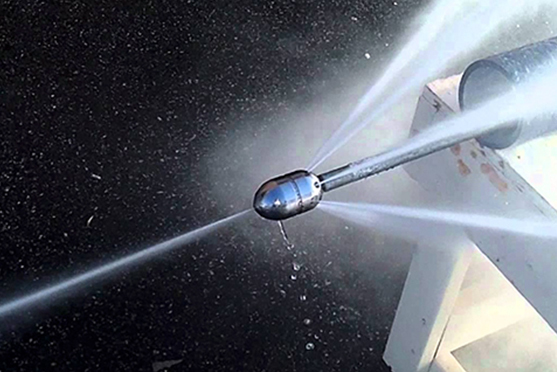 While the nozzles at the end of the reinforced hoses spray clean the surrounding area, they also shoot water backwards, providing a thrust and rocketing the cleaning nozzle further down the drain, pulling the hose behind it. Hydro jetting is ideal for situations where build up on the interiors of plumbing is considerable and extensive. Home drains often accumulate blockage over time, typically from grease and oil. These are all easily removed with drain jetting. Call us today to get your drains back to prestine condition.